Sorry for my few days being MIA from blogging! If you follow me on instagram or Twitter, then you know that I was in Kentucky. I took a mini-vacation road trip down there for 3 or 4 days for a few reasons. First, I have the best boyfriend in the world and he knows that I have the biggest girl crush in the entire word on Carrie and have ever since she was on American Idol. So as my anniversary present last spring he surprised me with Carrie Underwood tickets! Louisville, Kentucky definitely wasn’t the closest city to where I live that she was playing, but the date where she was playing near by happened to be awful timing for me. So he bought me a mini-vacation to see the love of my life (not really, but I can’t deny that I am a mega fan). Second, he had ulterior motives for going to Kentucky because he has an Aunt and 3 cousins who live in Lexington. So we spent 2 days with his family in Lexington and 1 day in Louisville seeing Carrie, and then the crazy 7 hour drive to get there and another 7 hours to get back. Anyways, now I’m a few manicures behind! So lets start with the second polish from my Butter London Ulta BOGO. 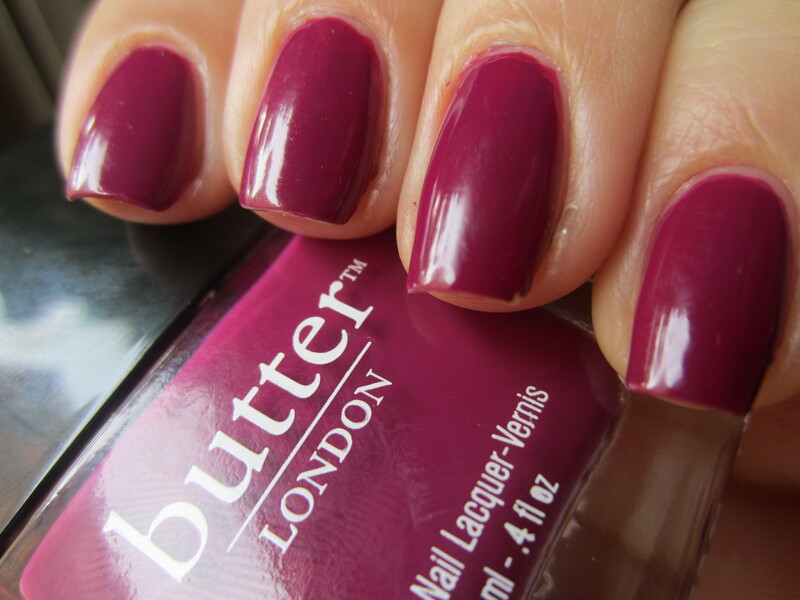 Butter London “Queen Vic” is a medium toned purpley-red, dark magenta creme polish. I’ve had my eye on this one for a while because its a great staple shade that I didn’t have in my collection. It can be worn for any occasion, any season and on any skin tone (I think). It definitely is a great color for fall because its super saturated and deep while not being that dark. But this color isn’t unique at all. Its unique to me, since I don’t own too many “girly” shades, but if you’re someone who likes deep magenta, I bet you have plenty of dupes in your collection. Formula wise, it was amazing! Like so many Butter London cremes I’ve tried, this was almost a one coater. 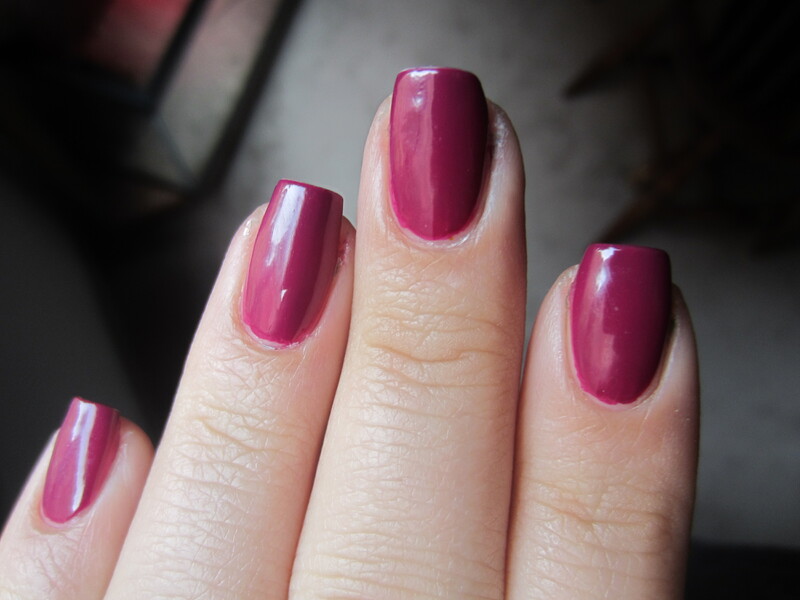 This is one coat and I did it at night, thinking that it was perfectly opaque. But I did see some bald spots near my cuticles on my non-swatching hand, which is normally what happens with my right hand. I don’t know why, but I haven’t mastered even coats between my right and left hands. It dried relatively quickly as well. I highly recommend this polish if this is a color that you’re looking for, like I was, and don’t have anything like it. What do you guys think? Do you have dupes? What are your favorite Butter London shades? ← MASSIVE Nail Polish Haul! !